This GE 3 way bulb is in the torch lamp in my apartment. My roommate says the bulb is original to the fixture and has worked on all three levels for many years. The interesting things about this bulb are the etch style with the "stacked" numbers, and the horizontal 50 watt filament. 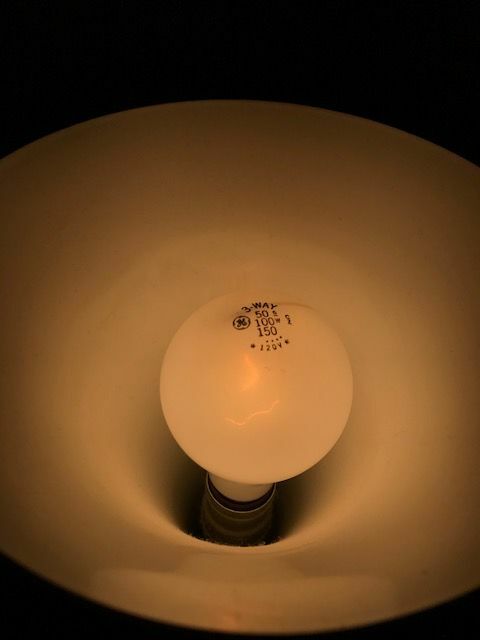 The 50 watt filament has two supports indicating that this older USA made 3 way bulb is better quality than most of today's GE products. Nice! How's your stay in New York so far? Going really great so far! Troy (right next to Albany) is a nice place and easy to navigate. I'm attending the Lighting Research program at RPI until next May for a Masters degree in Lighting Design. I was born in Troy and my dad went to RPI! small world huh! Last year, I was able to convince my brother to collect light bulbs! Nice! My roommate is really fascinated with my lighting classes and my hobby seen here. This older GE bulb lasted a year and a half with heavy use. They don't make them like they used to!